How does the QEnergySpa, BEFE Work? - Q the Experience, Future Life Science. Home / QEnergySpa, BEFE / How does the QEnergySpa, BEFE Work? How does the QEnergySpa, BEFE Work? The following information not only illustrates what the QEnergySpa, BEFE does but also how it works. The human body is a sensitive electromagnetic system that runs on millivolts. In other words, we are in reality a bio-electric machine. 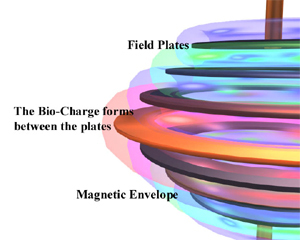 The body also generates an electromagnetic field, which is your “Bio-electric Signature”. The QEnergySpa is based on the principle that the body retains a quantum energy memory of everything experienced by the body. The QEnergySpa, BEFE was “created to re-balance and amplify the bio-electric signature of your body”, Terry, 1997 (inventor of the QEnergySpa, BEFE). It does this by imprinting electromagnetic fields into the water, and thereby into living systems, to give the body more energy. This extra energy allows the body to operate at it’s full potential. “All matter is made up of energy” (Einstein) in the form of electromagnetic frequencies. All cells in the body behave like tiny batteries, emitting and communicating via minute electromagnetic frequencies as well as electro-chemical signals. It is this intricate, bio-electrical circulatory system that allows one cell to communicate with its neighbour, through electro-magnetic signalling or resonance. An exposure in the form of infections, accumulated toxins, pathogen, virus, parasites, physical and emotional traumas etc disrupts the current flow to and between cells, thereby impeding the channels of intercellular communication. The QEnergySpa uses energy in the form of electricity which, when passed through a power supply, converts raw electricity into a format that is highly tuned, compatible and safe for all life. It uses approximately 27 volts DC to induce a magnetic field or wave-like structure delivered by a precise array of metal plates within the Orb. These individual magnetic fields when combined form a complex global field around the Orb submerged in the water. The Orb acts like an antennae, transmitting this energy into the water and naturally mimicking the body’s own bio-electrical system, according to Quantum Reality Field Science. The field created by the QEnergySpa interacts with the motional bio field of water and amplifies the volumetric content of the charge rate within the water pattern. The resulting Bio-charge is therefore the product of water, electricity, vibration/resonance, metal and magnetism working together as a whole. Unlike orthodox medicine, energetic medicine has no adverse side effects. This is due to the fact that signals present that are dissimilar, do not resonate and hence result in no effect. The frequencies travel back and forth from the person to the water reinforcing or imprinting those specific frequencies like a ripple effect into the cellular and extra cellular fluid of the body. Further, resulting in a template or residue of the bio-signature of the person into the water during the process. The micro tubular conduits within the cell regenerate to accommodate for the larger volume of bio electrical activity. This usable energy is stored in the fluid of the cells as a memory for up to two days after session and used by the body over the next 92 hours to accomplish its functions. Since the body takes a minimum of 24 hours to adapt to any organic changes, use of the system should be kept at a maximum of every other day. The new environment within the cells restores the natural balance and augments the body’s natural healing process. The cells bio-energy and potential energy reserve is increased and thus it no longer accepts weaker patterns from damage-causing matter as readily as it did previously. These beneficial changes are followed by subsequent improvements in chemical function and physical structure (i.e. electrical potential of the cell membrane wall). This results in the initial purging of toxins and nucleic waste through the normal waste elimination systems as far as necessary to restore the body to its intended bio-energetic signature. The QEnergySpa, BEFE does not kill or expel the microbes in contact with the healthy cells, rather it reinforces and optimises the signature state of the cells. With continued use, the physiological and dynamic balance of the human body (homoeostasis) gradually becomes restored. This method is not achieved by the direct infusion of frequency based electrical impulses that are commonly used in some treatments currently available on the market. “The amplitude of cell oscillations must reach a certain value, in order that the organism be strong enough to repulse the destructive vibrations from certain microbes…. Let us suppose a cell vibrates at a certain frequency and a microbe vibrates at a different frequency; the microbe begins to fight the cell, and sickness is started. If the cell cannot repel the stronger vibrations and if the amplitude of its own vibration is forced to decrease, the microbe gains in amplitude and its vibrations to decreasing and stop those of the cells, bringing on dangerous sickness or death. If, on the contrary, the living cell is started vibrating with the proper amplitude by inside or outside causes, the oscillatory attack is repulsed. The remedy is not to kill the microbes in contact with the healthy cells, but to reinforce the oscillations of the cell…… The main thing is to produce the greatest number of harmonics possible.” – George Lakhovski 1925.